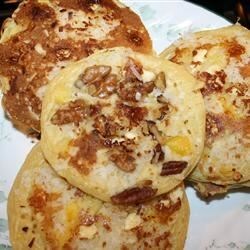 "With these pineapple and coconut pancakes, you can have a morning Hawaiian getaway right in your kitchen. These are sure to become a weekend ritual and will definitely impress any visiting guests." Beat buttermilk, milk, eggs, butter, and vanilla extract together in a large bowl. Combine flour, baking powder, baking soda, and salt in a smaller bowl; whisk into the buttermilk mixture until blended. Do not overmix batter. Squeeze juices out of the pineapple using a paper towel. Place pineapple, coconut, macadamia nuts, and chocolate chips in individual small bowls. Heat a skillet over medium heat and coat with cooking spray. Pour in 1/3 cup of batter for each pancake. Sprinkle a portion of pineapple over the wet batter in the skillet. Scatter some coconut, nuts, and chocolate on top. Cook until bubbles form and the edges are dry, 3 to 4 minutes. Flip and cook until browned on the other side, 2 to 3 minutes. Repeat with remaining batter. You can add more or less pineapple, coconut, nuts, and white chocolate based on your preference. I came up with this simply because I wanted to integrate pineapple into my pancakes. The white chocolate made it so my kids would eat it.